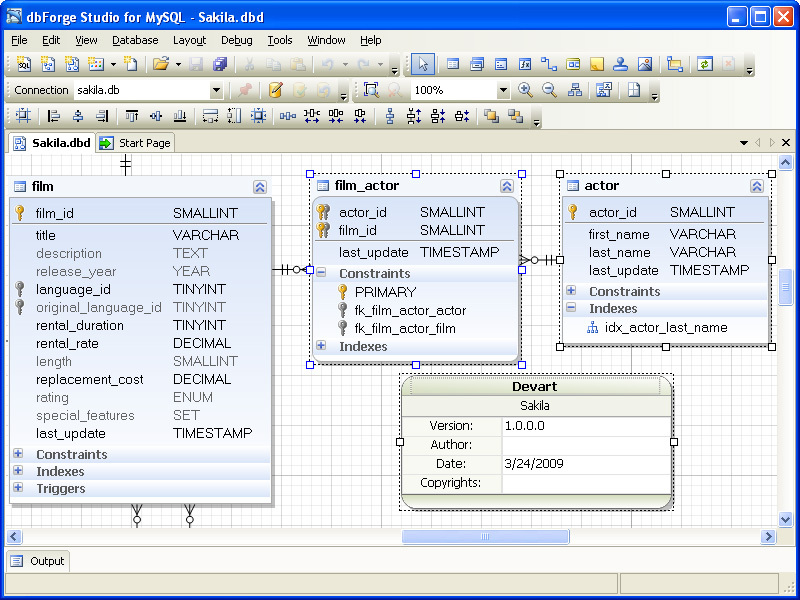 dbForge Studio incorporates MySQL Database Designer — a powerful visual design tool for database development that allows you to build a clear and effective database structure visually and to see the complete picture representing all the tables, foreign key relations between them, views, and stored routines of your database on a database diagram. Database Designer allows you to view and edit your database in a convenient visual way. You can observe all objects of your database, see foreign key relations between tables, viewing database objects information, easily access database objects for editing, retrieving data, executing stored routines. 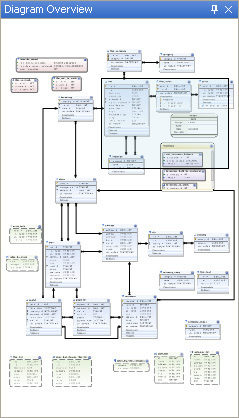 Popup menu of the database object on the diagram provides access to the same actions as the popup menu of the database object in the Database Explorer. Shapes, representing the database object, can be moved (by dragging them with mouse or by keyboard), resized, aligned to the diagram grid. Diagram can be saved for future use. With Database Designer you also can perform reverse engineering of your databases to IDEF1X or IE diagrams, which can be easily printed. Note: Diagram does not store information about database object details offline. You need an opened connection to database with the diagram objects to work with the diagram. To create database diagram perform the following steps. Click the New Database Diagram button on the Standard toolbar. Drag the database objects from the Database Explorer to the diagram. (Or you may create new database objects on the diagram using MySQL Database Diagram toolbar). You may add stamp to your diagram, that displays company and project names, diagram author, version, date, and copyrights. To add the stamp, click the New Stamp button on the MySQL Database Diagram toolbar. To edit stamp fields double-click them and enter values. You also may add notes to your diagram to add describe its objects. Save the diagram for future use. You can navigate the diagram in several ways. Moving mouse while holding the middle mouse button. Using Diagram Overview window. Just drag square visible area on the Diagram Overview window with your mouse. To display the Diagram Overview window select Other Windows -> Diagram Overview from the View menu or press CTRL+V, W.
You can zoom in and out the diagram to simplify the navigating. To quickly navigate to the database objects you may use diagram search. Click the Display Print Markup button on the Diagram toolbar. The print markup grid will be displayed. Gray stripes shows the page overlapping. Layout diagram for convenient view considering the print markup. After you have printed the diagram, you may turn off the print markup by choosing Print Markup from the diagram popup menu. 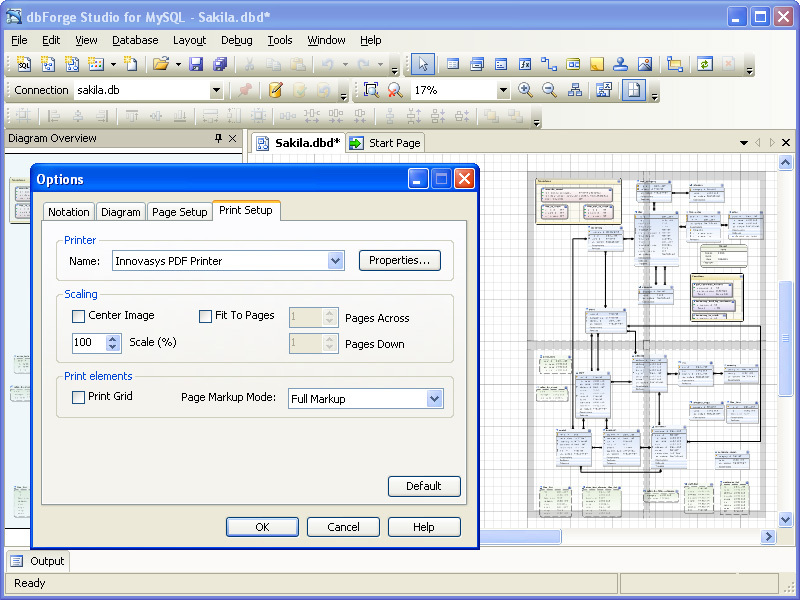 Diagrams can be saved and restored just like any other document by using Save and Open buttons on the Standard toolbar. Diagram does not store information about database object details offline. So, when you open the diagram, dbForge Studio for MySQL tries to establish connection with MySQL database, containing objects of the diagram. If connection cannot be established, the diagram cannot be opened.